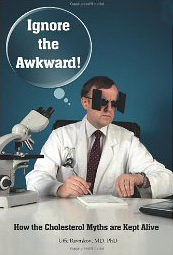 Dr. Ravnskov’s New Book: Ignore the Awkward! Tom Naughton December 2, 2010 December 2, 2010 39 Comments on Dr. Ravnskov’s New Book: Ignore the Awkward! One of the first books I read while researching Fat Head was The Cholesterol Myths, by Dr. Uffe Ravnskov. I was, to put it mildly, stunned. I highlighted so many sections, the ink began to bleed through. Too bad … that book is no longer in print, and pristine copies sell for hundreds of dollars. To fill the void, Dr. Ravnskov next published an updated and expanded version of The Cholesterol Myths titled Fat and Cholesterol Are Good For You, which I reviewed in a previous post. Both books employ two of my favorite weapons — logic and math — to poke huge holes in the Lipid Hypothesis. Perhaps more effectively than anyone on the planet, Dr. Ravnskov declares that the Cholesterol Emperor has no clothes, then sets out to prove his case. My aim with this book is to show how white has been turned into black by ignoring any conflicting observations; by twisting and exaggerating trivial findings; by citing studies with opposing results in a way to make them look supportive; and by ignoring or scoring the work of critical scientists. Most of the other 100 or so pages demonstrate how and why bad scientists keep the Lipid Hypothesis alive, despite the contrary evidence. I’m sure you can guess the why: money, money, and money. Scaring people into believing their cholesterol is too high is a multi-billion dollar business. 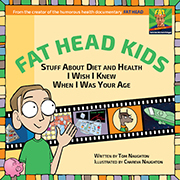 As I explained in Fat Head and Dr. Ravnskov recounts in this book, the current cholesterol guidelines were created by a quasi-government organization called The National Cholesterol Education Program. Read the financial disclosures for the NCEP committee, and you soon realize the committee is essentially Big Pharma’s All-Star Team. But it wasn’t the why that I found so interesting in Ignore the Awkward! — it was the how. In case you haven’t noticed from my posts and recent speech, I’ve become a bit obsessed with the topic of bad science. In chapters with titles such as How to Exaggerate Insignificant Results and How to Lie Convincingly, Dr. Ravnskov provides plenty of examples of how bad science is done. One common technique is simple selection bias, otherwise known as cherry-picking. If you dig through the scientific literature, you can find studies that refute the Lipid Hypothesis. But you’ll have to dig deep because, as Dr. Ravnskov demonstrates with citation figures, if one study supports the Lipid Hypothesis and another published in the same year disputes it, the supporting study is far more likely to be cited in other papers — at least six times more likely. A large body of epidemiological evidence supports a direct relationship between the level of serum total and LDL-cholesterol and the rate of CHD. Dr. Ravnskov examined the studies that were cited and found that most didn’t mention LDL at all, one concluded that LDL is not a heart-disease risk factor, and one — only one — concluded that LDL is a risk factor … but only in men ages 35 to 49 and women ages 40 to 44. So the “large body of epidemiological evidence” turned out to be a single study in which LDL was identified as a risk factor — but only for people in certain age groups. Although the results of this trial do not permit firm conclusions, they support the idea that also among female populations the serum-cholesterol-lowering diet exerts a preventative effect on CHD. So the low-fat diet fails, but the results “support the idea” of prescribing low-fat diets. Ladies and gentlemen, welcome to scientific never-never land. Within the context of the total literature, however, the present observations support the conclusion that the lipid composition of the diet affects the level of serum cholesterol and the long-term risk of death from coronary heart disease. Look at the emperor’s new clothes, ladies and gentlemen! In the context of his total entourage, he is wearing clothes, and they’re lovely! 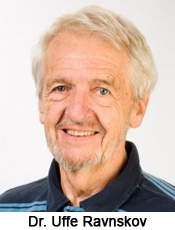 It is highly unlikely that the experienced researchers who have written the dietary recommendations should have made such flawed conclusions as Ravnskov claims. To answer Ravnskov, it is necessary to examine all of his arguments in detail. This is not possible. The author may not be aware of a vast body of literature that convincingly supports the association between saturated fat and heart disease. In other words, We can’t dispute the data presented here, so we’ll just declare that Dr. Ravnskov is wrong because so many of our peers say he’s wrong. Not all anti-cholesterol hysterics are satisfied with merely saying Dr. Ravnskov is wrong. After all, he has managed to get some of his papers published, he’s written books, and he’s more or less elbowed his way into scientific conferences to present his case. He’s a threat. So a handful of scientists have apparently waged a campaign to portray him as a crank or a conspiracy nut. Someone even managed to hijack his email account and send out kooky emails … including one that was full of foul language and informed the recipient You really need to get a clue, you stinky buttholed woman. I’ve read Dr. Ravnskov’s books and some of his papers, I’ve interviewed him, and I’ve exchanged emails with him. Trust me, his rhetorical skills are a little more polished than that. If you find that what I have written is hard to believe, please consult the sources given at the end of each chapter … by doing this systematically, as I have done, you will not only discover the truth for yourselves, you will also learn more about cholesterol and the heart than most doctors. Sadly, he’s right about that. Fat Head is on Hulu! At some point, a critical mass of people will catch on that the lipid hypothesis, “healthy whole grains” and artery-clogging-saturated-fat are a lot of tripe. At that point, I wonder if people will just stop going to the doctor except for the occasional infection or injury since the medical professional will have lost its credibility. Maybe doctor jokes will be the new lawyer jokes. I’m not saying these are necessarily good things–just that they’re possible. BTW, I love the cover with the blinders. It’s a great cover. I’m already at the point you described; I don’t trust most doctors anymore. I’ve gotten too much bad advice over the years. Tom, always a revelation. I just sent in my request to get the book on Kindle, I am in India working. I come from the stand up world too but, like you, find the health field far more rewarding. How about a post on how to/you keep a fun/funny outlook on all that you report on? It gets deep and depressing if you face the monolith ahead of us. Go for the laugh as you go for the throat…brother. If we don’t keep a sense of humor, the bad guys win. Another threat to Big Pharma. You never fail to crack me up, Tom! I’m going with Pharmaho! Lori said: “I wonder if people will just stop going to the doctor except for the occasional infection or injury”. There exists NO other reason to go there but infection and/or injury (atleast for males). Not doing so may save your life! This is not just about bad diets. e.g. Most people experience depression at some point in their life. DO NOT approach a medical doctor if it is your turn. It will pass. Do nice things for yourself for a while. Unless ofcourse you want to get kite high on what is essentially psychadelic drugs …but with all the fun removed! *Protip: also, these drugs are suspected to cause elevated levels of suicide and blodcloths. If your child is a bit ‘rowdy’ (Aka. ‘a healthy active and investigating child’) and their teachers tell you so. Do not approach a medical doctor unless you think amphetamines are a natural part of childhood. Rather, cut the sugar and put them on pasture for a couple of hours a day. *Protip: Find a new school. That book is going on my Christmas list right now! I read his earlier book and loved it. I’m at the same point on the doctor front too. Going to the doctor is bad for your health! LOL. Sad but true. To paraphrase Mark Twain’s remark about newspapers, if you don’t see a doctor, you are untreated. If you do see a doctor, you are mistreated. “You may choose a more descriptive verb.” Yeah, I could – but you don’t get all potty-mouthed on your blog, so I ain’t gonna get all potty-mouthed on your blog. I can open a can of potty-mouth with the best of them when I read about this nonsense, but I clean it up while writing. I know it’s only a matter of a few years before it occurs to my girls to Google me and find my old posts. It looks like Dr. Ravnskov is making the same mistake lots of contrarians make: He’s not playing the rest of the game. If you’re going to challenge the status quo on the facts, you have to have your image straight. “Real” scientists have headshots taken in suits or lab coats. Everyone Know That[tm]. Sad but true, you can’t challenge the guy in the thousand-dollar suit while wearing a pullover shirt. Image does matter. When I interviewed Drs. Eades & Eades, they asked what to wear. I told them it may seem silly to wear white lab coats in their own house, but that’s what people expect to see. The ‘healthy whole grains’ emperor definitely has on no clothes. “Pay no attention to that man behind the curtain!” The blinders-on wizards of lipophobia don’t want us to see what our lying eyes (and experiences) have been screaming at us for a while now -that saturated animal fat does a body and brain good..
Dr. Ravnskov has taken some “heat” for being intellectually honest. He joined the establishment, so to speak, and then spoke against it because it was the right thing to do. Not many people have that kind of courage. We all owe him a lot. Very interesting. All kinds of ways a clever number-cruncher can torture the data. We do owe Dr. Ravnskov a huge thanks. I lent his first book to my mom, then my mother-in-law. Both quit worrying about their “high” cholesterol and went off statins. Tom, have you seen the Fall 2010 issue of Regulation: the Cato Review of Business and Government? There are two articles that may interest you: “Would Soda Taxes Really Yield Health Benefits?” and “Restaurants, Regulation and the Supersizing of America.” To sum up, the authors use empirical evidence to contend that soda taxes won’t help and fast food joints aren’t making us fat. I just read the second one and will post on it soon. Gosh, I wish I hadn’t dog eared the pages of my “Myths” book… but then again, I’d never want to sell it. That was a very nice endorsement of Ravnskov’s new book. Can’t wait to read it. Statin Sluts, Pill Pimps, PharmaHos…. brilliant! I wouldn’t sell my copy of The Cholesterol Myths either. Without the cholesterol myth, big phama would lose $$$$$. I saw an encouraging item on Diabetes In Control the other day. Seems that diabetics are less likely to comply with statin therapy than with blood sugar meds. Either they are wising up to the cholesterol propaganda or they are being ravaged by side effects. Of course, I’ve failed to comply from the get go. Politely detail the skulduggery and deceit that has AHA promoting Heart Deadly omega 6 oils. The result of these dishonest deceptions is that people are dying unnecessarily. We shouldn’t be so complacent about what is tantamount to murder. Outstanding posts. I didn’t realize the studies in which investigators replaced saturated fat with PUFA were also replacing trans fat. That alone is one huge confounding variable. This seems to have a little of all the techniques of scientific subversion. Even without the statistical hanky-panky, I’m guessing we’re looking at the effects of high blood sugar and/or insulin resistance, not being overweight per se. I’m glad the article at least quoted Dr. Blair, because I think he’s got it right. Look at the people who are fit but “fat,” and you don’t see a higher death rate. So you see, I don’t blame primary care doctors for continuing to prescribe statins. Most are relieved (or don’t care) when I call them with an excuse to withdraw it (I’m a psychiatrist). But it’s a hard situation. That’s a tough position to be in. My opinion of doctors and statins was probably colored by the fact that when we took my dad off statins, his cardiologist went berserck. You’d think we’d just threatened to deprive Dad of food and water. Did you see the interview Jimmy Moore had with Dr. Barnard? That’s the guy who wrote the book my Mom WAS reading before I told her about the interview. Aye aye aye… The stuff he says is pretty crazy. The PCRM goof … nope, I’m catching up on Jimmy’s interviews and haven’t gotten to that one yet. I’ll need to steel my nerves first. I wish Dr. Ravnskov’s books were available as ebooks on the iPad and Kindle. I buy most of my books now on the iPad and carry that around with me to read. I believe the newest does come in a Kindle version. As a 54yo male who in the last 20 years has only been to the doctor to get forms singed etc, I agree fully. I must add tho, on one visit we were discussing my diet, (the doc quite horrified) I was persuaded to have a blood panel done and as I was curious myself I agreed. When all the tests came back better than perfect, as I expected, I was still handed the standard printout sheet advising me to reduce my fat intake and increase my “healthy grains”. Needless to say it remained behind in the waiting room rubbish bin when I left. That high-fat diet is going to catch up you with around age 100 or so. The medical provider industry has to be changing in the next 20 years. The only way to get costs down is to increase the supply of “healers” and decrease the demand for them. People will have to question if a MD is just artificial degree inflation to protect the status quo and if they’d be satisfied with someone with a lesser degree providing good enough care at a much better price. Naturally, some states have done the opposite and outlawed the cheaper competition for doctors, such as naturopaths. Last time I went to the doctors was to get three teeth pulled that had root infections caused by all the carbs I was consuming back when I was on my low-fat whole grain diet (and too naive to realize that sugar could somehow make me fat). I haven’t been to the doctors since, despite everyone’s insistence that I stop eating so much butter and go get my cholesterol checked. No more tooth pain or infections mind you. The most sick I’ve been has been a mild case of the common cold. And it’s funny that people still look at me like I have two heads when they see smothering my fatty steak in butter after cooking it in coconut oil. That’s one of the side benefits of changing my diet that I hadn’t really anticipated: no more cold sores, bleeding gums, or tooth pain. That comment “That high-fat diet is going to catch up you with around age 100 or so.” to Alan reminds me. Is the benefits of the VLC (Very Low Calorie) diet in extending life, at least of lab animals, due mainly to the reduction in carbs? That is can we expect a similar extension of our lifespan by eschewing carbs as we would get from the VLC diet? I think so, but here double blind placebo controlled trials would be difficult to design and unethical to run. Best they can do is animal experiments. The extension in lifespan appears to be due to lower blood glucose resulting in lower insulin levels. My new mantra. Thanks for the chuckle. I’m also one of those who wish I didn’t have to visit a doctor – but since getting diagnosed with Hashimoto’s last year I’ve been getting forced to see the doctor every three months for blood tests, to get thyroid medications. I ***HATE*** it. I HATE HATE HATE going. Until this past year I never saw doctors much more than every few years, and that was the way I liked it. Not to mention every visit to the doctor results if horrible arguments as she is rabid to put me on statins. 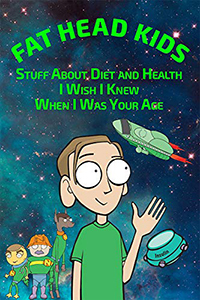 Tom – Thanks for posting about the new book – I have a copy of “Fat and Cholesterol are Good for You” great book. I’m placing my order today for the new book. Actually I have quite the library at home of anti-establishment health books. Whenever I make a comment to family or friends like “you know there’s nothing wrong with saturated fat” and they give me that look, I just go grab a couple books and offer the books to them. Then they usually kind of believe me. (Or they start thinking I’m a real kook). She didn’t know it was fat?! I really wonder when humans started being so greedy and horrible. My guess is when we started a monetary system. All that is wrong in the world is based on greed. You and all the other “truth providers” should be proud of what you’re doing. I know I am thankful. I think greed has always been part of the human condition. This is for Debbie- I also see an endocrinologist for Hashimoto’s. I was seeing one who continued to insist that I should finish having babies so that I could go ahead and have bariatric surgery! Needless to say, I found another endocrinologist that is 100% on board with my low-carb weight loss success and is not brainwashed into thinking that low-carb will kill me someday. I recommend that you try a different endocrinologist until you find one that is willing to work with you. This is utterly disgraceful… It would take too much time to see if his argument has merit, so they’re just not going to try at all? Seriously? I can believe that someone would think and act like this, but to actually SAY it publicly? The audacity! They were at least smart enough not to say it publicly. Dr. Ravnskov copied the explanations from notes given by peer-reviewers who recommended the journals reject his papers. There’s a good phrase for this situation: Name and shame. Tom, I hate to say it, but the evidence is shifting strongly in Uffe’s direction. You might look at the meta-analysis conducted by Ronald Krauss, MD, published in the March 2010 American Journal of Clinical Nutrition. He found absolutely no link between saturated fats and cardiovascular disease. He explained that the emphasis on saturated fat as a risk factor seems related to publication bias. Yup, I saw that. There’s hope. The Swedish food authority SLV said Ravnskov is not worth attention because it it “one man´s opinion”. With all his source references, it is unclear to me how they can claim sometning like that. But it was effective as a way to get out of a bind. The interviewer had no further question. That´s called media coverage. Perhaps they believe Dr. Ravnskov has multiple personalities, they all publish in journals. You’re right – Statins are not the answer and never were. I’ve been exploring this for years and realise that the industry – and it is a big INDUSTRY – is a huge con. For those who wish to see what the answer is if it is not statins, have a look at my website. View the extraordinary stories of the High Desert Heart Institute and interviews with some of the world leading pioneers in preventative and remedial heart treatment. If you not convinced you may just as well give up and consider the emperor to be wearing clothes. Talk to me and see how you can change the world and save lives of those close to you. My wife went to pick up her cholesterol results yesterday armed with this book. The doctor looked to the ceiling and said “How boring” when she started to explain Ravnskov’s work. “Why so many investigations?” the doctor asked. It’s obvious some of them do not like the internet because it means they get found out not being the god-like figures they like to pretend they are. After 3 months without any symptoms of colitis my wife pushed the boat out a bit over the holidays with wheat, sugar, PUFAs and, like clockwork, back her problems came with a vengeance. The doc refuses to see a link between her colitis and her diet. Only drug intervention can help apparently. One last thing, Tom, I have to thank you for the “painting the lawn green” metaphor regarding statins in another post. It is a valuable argument I will be using a lot. Cheers. Cheers to you, Shaun. Your wife’s HDL is incredible, and the triglycerides are impressively low. I’d say the diet is working. I think Dr. Ravnskov is the character on the cover. Thanks for a great review. I am just about to buy the book and this review has confirmed that it is a must read. I am already a total cholesterol sceptic, but having move good information to ‘fight the good fight’ is essential if we are going to turn this thing around. These tactics against Dr. Ravnskov, who is a great man, are a classic example of how peer – review simply does not mean anything. Lots and lots of junk is published every single day. Lots of junk gets by the referees as well. This system has major problems and is often abused. Good science has been left out and crap has gotten through many times. It is worth noting Isaac Newton’s Principia Mathematica, Albert Einstein’s Theory of General Relativity and Darwin’s Evolution of Species Theory were NOT peer-reviewed. Yet, they represent some of the finest science in the history of this human endeavor/creation. *Most scientific ideas are wrong. *Most experiments are wrong, too, the first time they are done. These two points are essential. The ONLY thing that matters in science is this: If somebody else finds your work interesting…. And they take it up…. And they perform detailed observations and experiments… And it works….. And it gets to be done more and more and more and more.. Then , and only then, does something become part of the cannon of science. In science, the more important your discovery , the more important it is to verify it. Scientists do this not only through replication BUT ALSO developing many different independent testing techniques and methods. When all of these multiple techniques/methods of testing point int he same direction or get the same result , it is very likely you are correct. Global replication from different scientific groups who are all using MANY multiple independent and different testing methods/techniques. That is what is needed and what was done int he discovery of Dark Matter and Dark Energy for instance. Peer – review is not the arbiter of ANYTHING. It is NOT the arbiter of truth whatsoever. It is often a bunch of stuffy codgers who are journal editors wanting to keep the status quo. There is talk of doing away with it entirely in favor of something better.